It’s time for our “Colonial Raised Bed Garden Reveal”……we were so excited to show you all these photos that my husband climbed up with his climbing tree stand which I must admit did make me a little nervous. 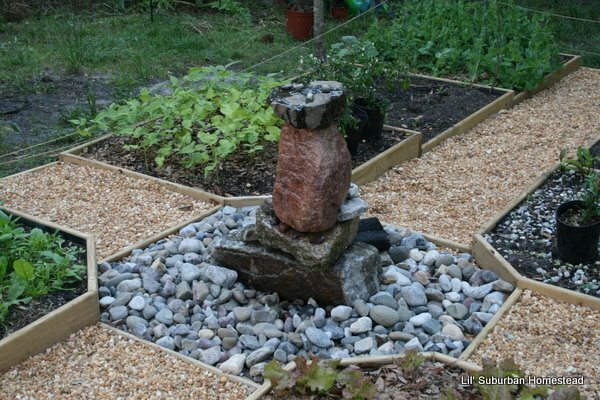 We are so proud of how well it turned out now once we added the gravel, the fountain, and the river rock it did raise our budget on this project however you could do this same project with less expensive options too. Now what you cannot see very well in this picture is that at the left end of the garden as shown in this picture are some homemade trellises built out of our bradford pear tree branches will be used more and more as the garden matures. 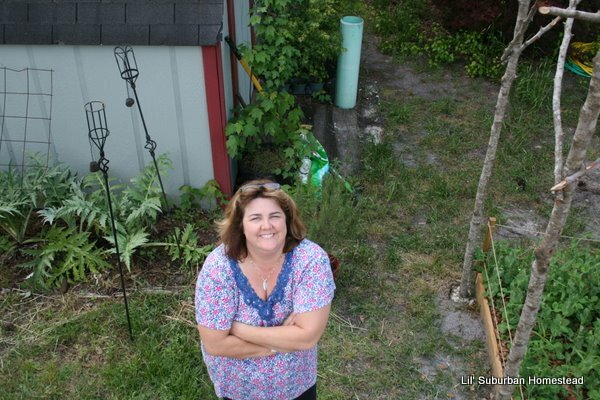 You can see a little more of the trellises in the background of the photo of me! We went to Stone Garden to pick up the river rock which is a field trip in itself…..it is now one of my favorite places to dream up some more ideas for our lil’ suburban homestead and in the photo above you can really see a close up of the river rock we picked out! 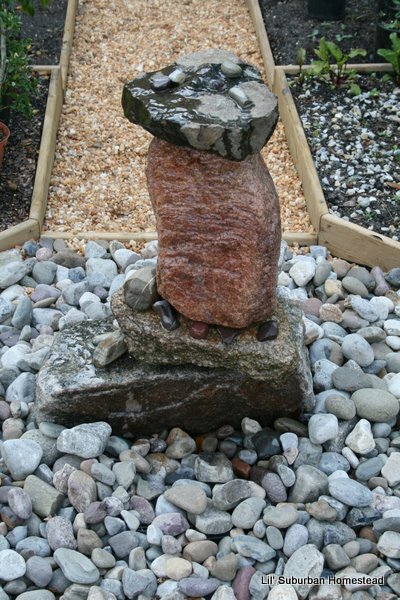 I have to say I love this beautiful “one of a kind” fountain the Viking in my life built me…..my husband drilled holes through all of these rocks and stacked them together and the fountain just sounds beautiful while its running but it’s not only designed for beauty it’s also a watering hole for our bees. 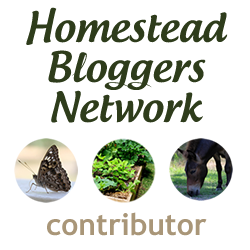 It’s time to link up to The Ole’ Saturday Homesteading Trading Post Edition No. 20. but just as a side note every time I mention to all of you that I have a plan on the horizon something else comes up….so now I really know what the expression “the best laid plans” means. So no more planning for a while at least on the project front I am just going to go with the flow. If you are like me you are extremely busy right now so feel free to link up anything you have done this past year or even dig in your archives. You won’t want to miss them! Click here to view all blog link ups this week! Thanks so much for linking up and if you don’t have a blog thanks for stopping by and checking out our Lil’ Suburban Homestead! Thanks for taking a tour of our new Colonial Raised Bed Gardens! Man, that is one beautiful garden. I love the overview picture and your fountain is beautiful too. Thank you Christy! I abSolutely love it and I really like that it reflects our style! Have a great day! That is so beautiful! What a great project with great results!! And a great top picture looking down! You must be so happy with the results of your hard work! I love it! It’s beautiful! What a sense of satisfaction you must feel. Rose Petal we absolutely love it and what I love the most is that it is so efficient…..the summers get really hot here so the finishing touch will be the irrigation system that will be very simple but its coming! 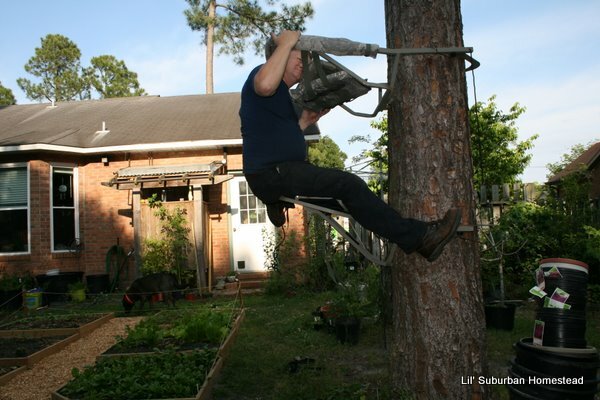 True we won’t do this all over our yard so our high maintenance plants will go in here! Linking up now! Thanks for hosting! Those look amazing! Are the squares 4 x 4 feet? WOw! it looks fantastic!!! awesome job! We were quite pleased thanks Ewa! Lots of work and I love I can quickly and easily get to my lettuce, spinach etc…. you should be very proud of it. it’s really an amazing place! Ewa I can tell you feel my joy! Thanks so much! We are really enjoying it! KarenLynn, I’m noticing the trellis beside you. We have been making twig fences and I’m intrigued by your tall trellis. Can you comment more on those, and is there a picture of them? That is a beautiful garden! I love it! Thanks Sarah I am so enjoying it! Really pretty ! You all did a wonderful job. Most of the credit goes to my husband but I am thrilled and love going out there to pick my greens in the evening! What a fantastic project! You must be ecstatic. And I love the fountain. I will have a fountain in my garden some day. Congratulations. It is a garden to be envied! Thanks Simple P! I have enjoyed it I am hoping tomorrow I will have time to just sit and listen to the fountain! One of my joys of gardening is being able to actually sit and enjoy it once in a while! That’s gorgeous! Y’all did a great job! Thanks Grace! We are really enjoying it right now! So glad you stopped in! That is simply amazing! I can appreciate all of the work and planning that went into this beautiful garden!! Thanks so much! We really did put our heart and soul into this project! Wow you all did a great job, it is so pretty. Thanks Kelly! We love it! Thanks for stopping by too! Looks grea! My daughter and son-n-law live in the city and have been wanting to do this. I am not very smart w/ this technology. So I need to ask how or where is the information to do this project is. Can you help me? Thanks and I plan to be a future follower. Deann I am sure my husband could post the plans he kept it very simple now the fountain was blood, sweat and tears and not so simple but the actual garden took time and I would be happy to post them for you this winter! Thanks for stopping in and I love to meet new followers welcome! Love this, so beautiful and inspiring! makes me want one like it ;). Now, lets hope spring comes soon and we all can plant a garden. Will share this!